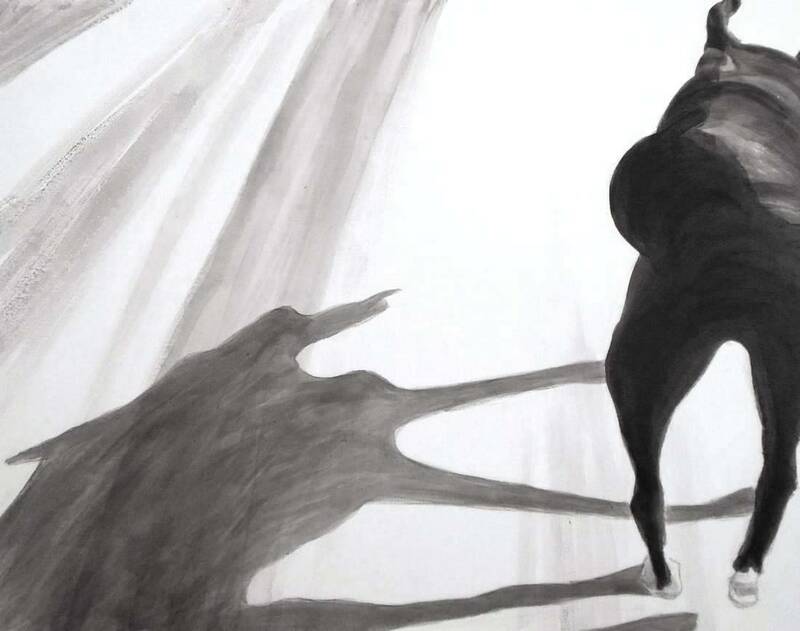 Mookie, shown in head-on silhouette, throws leggy shadows as Sadie looks on in this dramatic late afternoon scene. Find more information on individual works using these links: Dance, Doug speaks 1. For related paintings see the archives of Dog Studies now in collections. Tail, more info in Archives. DOG STUDIES began in 2007 after photographing my dogs frolicking in the snow. 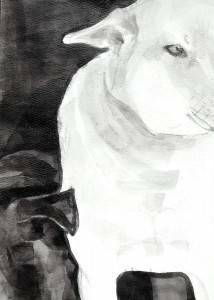 The high contrast of dark body against white ground showed me the elegance of the dog form. The first paintings that developed from that beginning used simple black acrylic washes on a white canvas. 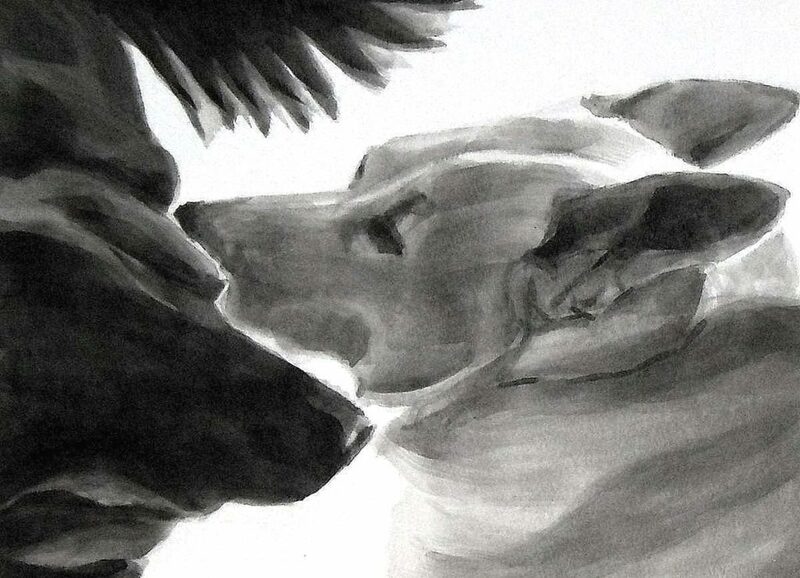 I chose to focus on close-up views to depict the intimate relationships of the canine companions. 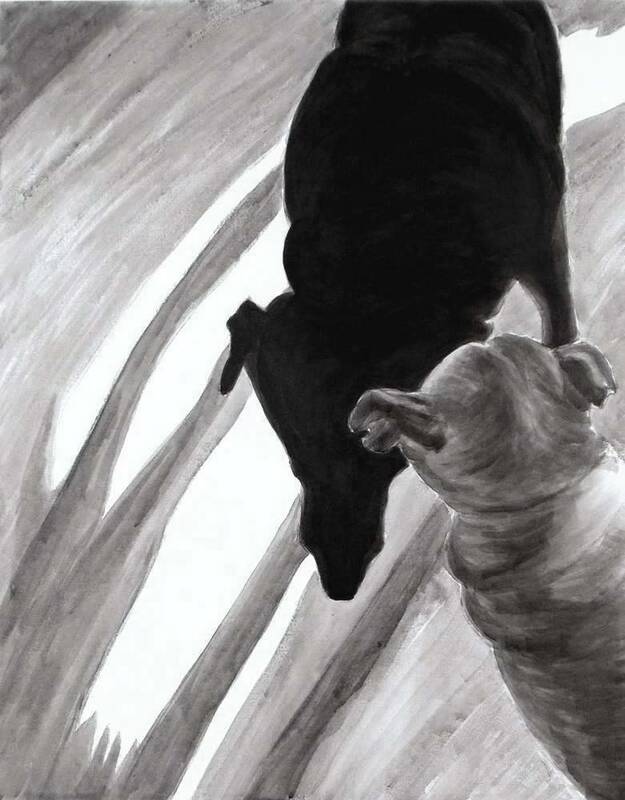 These paintings have become memorials to those beloved companions who have passed on. Read the full artist statement. 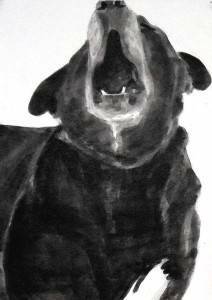 Doug speaks 1, c.2008, Dog Studies, Original Series, black acrylic on prepared paper, 12" x 9"
The impetus for Dog Studies was a deep, school-closing winter snow in 2007, a new digital camera, and the pure joy of documenting the frolics and interactions of my dogs (and cats). The photographs soon evolved into simple painting studies juxtaposing interesting shapes and negative spaces. 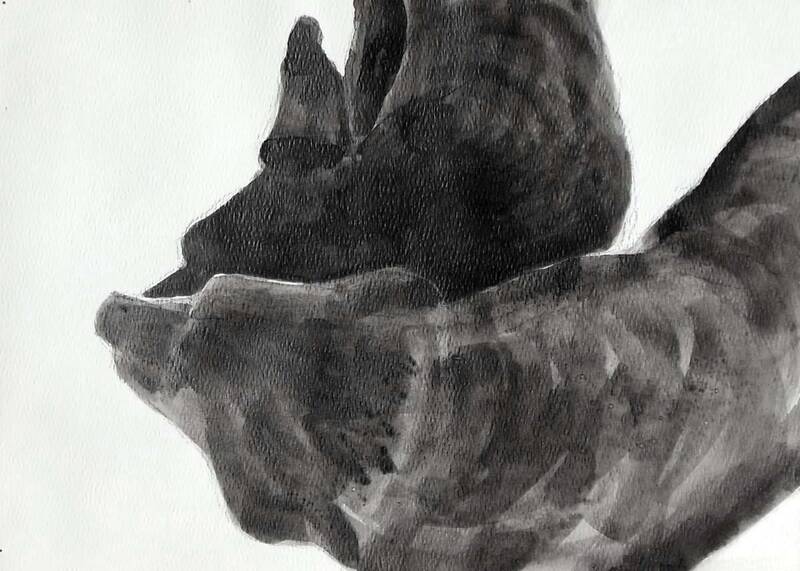 I had not painted seriously for years and these studies took me back into the studio on a regular basis. To compose a painting I cut and paste and draw freehand. The metamorphosis continues with changes in scale and the brush of wet acrylic modulating values and textures. For this last phase I use a watercolor-like technique to slowly layer black paint on a white surface. See how my process has evolved in this video post and this one. I call these paintings “studies” because, with a goal but not a plan, they eased me back into art making. They are imperfect; for example, some retain traces of changes in composition. And they are leading my art in a new direction. 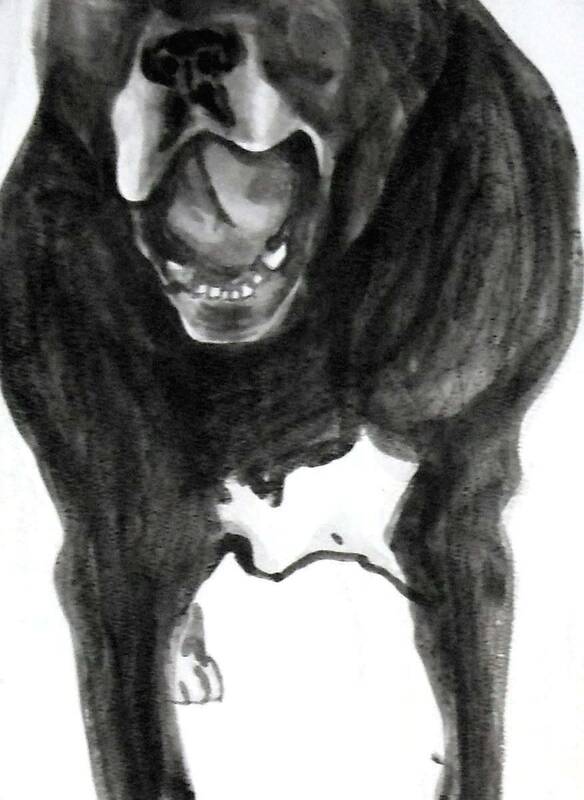 Dog Studies emphasize the elegance of body language through the striking contrast of black and white. The zoomed-in views, isolate quirky shapes and the telling negative space between companions. They are intimate portrayals of individuals and relationships. They are tributes to the profound impact that our pets play in our daily lives. 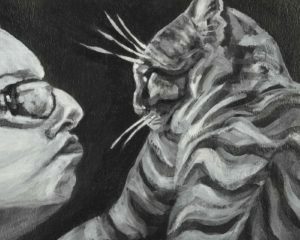 Since several of the models have passed, the paintings have also become memorials to beloved pets. Black and white is not my perspective on life; yet I find it loaded with potential as an artistic mode (and I don’t mean just as metaphor.) This combination is considered monochromatic, yet it is the ultimate visual dichotomy. 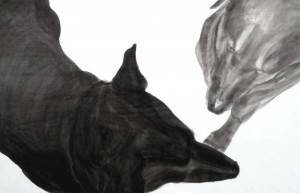 Admittedly I am relieved to see the world so clear cut when I escape to the studio with my canine companions. 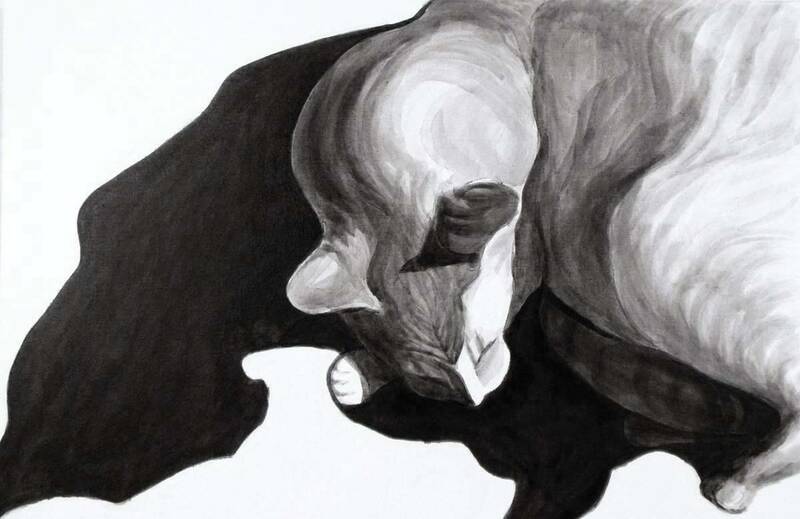 My art, explores the seemingly dualistic nature of life. Yet the nuance of grey inevitably insinuates itself into the picture. Is it a coincidence? or an irony? that my initial models for this polaristic series were not purebred but instead mergers of mysterious lineage? Maybe it’s kismet.